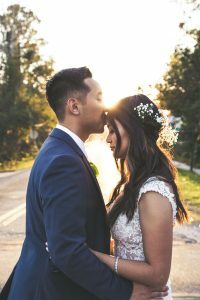 As you begin planning your wedding, there will be a ton of different aspects you need to think about. From the venue to the music, you want everything to be perfect. But your bridal look is also important to creating the perfect wedding day! After finding your dress and picking your wedding colors, you will need to think about your hairstyle. There are so many different bridal hairstyles, from simple to elegant and intricate styles. Finding the perfect one that compliments your wedding style, personal style, and dress style can be difficult. If you are stuck trying to figure out what bridal hairstyle to choose, or you simply want more ideas, read on! You can also schedule a bridal hair trial at The Skin & Body Spa in Nashua. We will help you find the right hairstyle for your big day! A chignon hairstyle is a classic wedding look. To create this hairstyle, your hair is gathered into a knot at the back of your head. This is a great hairstyle for every style because of the versatility. This style can be made to look sophisticated and elegant with a smooth knot or twist. Or you can choose a messier look by adding piecey curls and a loose look. This is a beautiful hairstyle that could be the perfect choice. If you are looking for an updo that can be altered to fit your style, choose a chignon hairstyle! There are many different bun styles to choose from for your wedding style. An elegant and simple ballerina bun could be a beautiful choice for any bride. Like the chignon hairstyle, a bun can be made to look more elegant or have a beautiful and messier look. You can even get funky with it and do multiple buns, whether you choose to do mohawk buns or space buns, there are many styles that can match your personal taste! There are some brides who are unsure whether they want an updo or a down ‘do. Why not both! A half-up hairstyle can be the perfect compromise for those who are unsure. Pull half your hair back into a twist, create a bow with your hair, put it in a braid, or choose a mini messy bun! When you choose a half-updo, you will have many options to make it your own and create a look you want. If you want to keep your hair as simple as possible while still adding style, a down ‘do is a great choice. 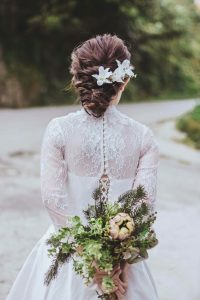 You could add some waves, curls, hair accessories, and even small braids to give your bridal hairstyle a unique look. A down ‘do is fun because you can add anything to it and you don’t have to worry about anything messing it up. This is a great style if you want to wear a flower crown, a jeweled headband, or any other type of eye-catching accessory. Braids are another style that can be altered to create your perfect look. Whether you want an updo, a half-up style, or some sort of down do, braids could be a great choice. Braids are a beautiful, elegant, and stunning way to style your hair for your wedding. While they can be simple, they can also be made to match your wedding style and have a fancy touch. These are a few of the many bridal hairstyle ideas that you can choose from! At The Skin & Body Spa, we can help you find the perfect ‘do for your wedding style and personal taste. Contact us today.